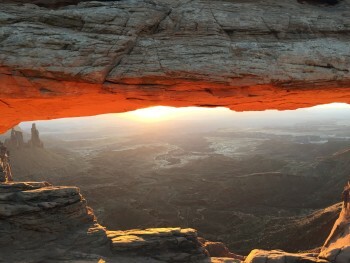 By now, we have all heard that Moab, UT is one of the premier adventure capitals of the West. What is it though, that makes it such a great destination for everyone from sidewalk strollers to base jumpers? Besides going on one of our already planned incredible 4 day excursions (see: Cataract Canyon, Southwest Sampler, Westwater Multi-sport package), here’s a complete itinerary of my ideal Moab long weekend excursion. After arriving in Moab the night before, the anticipation of adventure is killing me and I can hardly sleep! It is day 1 of vacation and I cannot think of a better way to celebrate but to wake up at 4:30 am and drive to Canyonlands. 4:30 might sound like a ridiculous time to wake up on vacation, but the view that you get at Mesa Arch is more than worth it! After a short, easy hike from the parking lot, I am looking through an incredible arch that crests the rim of Canyonlands National Park. The sun slowly starts to creep up behind the LaSal Mountains, which are still covered in a beautiful white blanket of snow. As all of the photographers line up to get the shot of a lifetime, the belly of the arch turns a color of orange that I have never seen in my life. As I sit next to the cliff side and look over the valley of Canyonlands National Park I can’t help but wonder how this incredible area was geologically formed. It all looks like a screensaver to my computer but in real life! Once the sun has finally risen I am feeling refreshed and awake, and it’s time to go on a little more adventurous of a hike. False Kiva is a 2.5 mile round trip hike that is not too strenuous but does requires some navigation to stay on trail by walking over some bigger rocks. At the end of the hike I am standing in a sort of cave that contains the remnants of Native American ruins that were placed here over 1000 years ago! As I turn around I am greeted to more majestic views of Canyonlands National Park. This is one of the most magnificent National Parks that I have ever been to, and the crowds are minimal! I could spend weeks in this place! 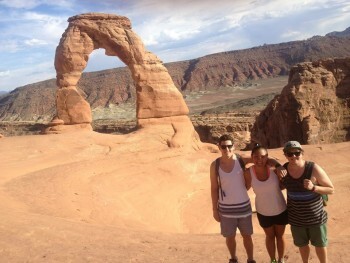 After a nice stroll through the Devil’s Garden I decide to go see one of the most iconic image in Utah, Delicate Arch! As the only free standing arch in the park, there is no wonder that Utah has adopted this image to represent an extraordinary state! The hike to Delicate Arch is a 3.2 mile out and back hike that gains about 670 feet of elevation on the way up. As most things that you see in Utah, no picture can come close to doing this justice. This is one of the most unique national parks that I have ever been to! A couple days full of hiking has me wanting to sit back and relax today, so naturally I am going to float the mighty Colorado on the Moab Daily. 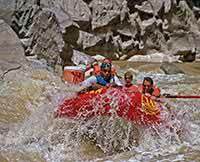 “Mighty” could be a bit of an overstatement, as the full day trip consists of 14 miles of serene river with anywhere between 4 and 6 rapids depending on the time of year. 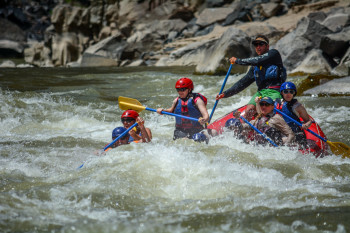 These splashy class I-III rapids keep the day entertaining as we float down the river without a care in the world. Starting out in wide valleys that look straight out of a John Wayne film, there is plenty of time to swim in the water, participate in water fights with the other boats, and just relax as we float in the current. After so much “hard work” on the water, we pull over at Red Cliffs Lodge and have a delicious barbecue lunch on the River Deck. The river day finishes after floating the last few miles down the river corridor, looking up at 2000 foot cliffs on both sides of the river. After arriving back in Moab, I am itching to catch one of these world famous Utah sunsets. Dead Horse Point is about a 40 minute drive from Moab, and you end up overlooking the river from the rim of the canyon just downstream from where the river trip was floating earlier in the day. I would argue to say that you haven’t experienced a true sunset until you have seen it from 2000 feet above the river. After watching an incredible sunset at Dead Horse Point, I had to stay and watch the stars come out! Dead Horse Point was declared an International Dark Sky Park in 2016, which means you are almost guaranteed to see more stars than you have seen in your entire life. This is where I finally understood why the Milky Way is called the Milky Way! The stars are so prominent in the sky that it sometimes actually looks cloudy from the high concentration of stars! When people think of Moab, they are probably more likely to think of the red rocks than the forests. However, one of the best ways to beat the heat in Moab is to head to the mountains! The La Sal mountains are just 30 minutes south of town, and because they have some peaks that almost reach 13,000 feet in elevation, it is not uncommon to see snow up top most of the year. Lake Oowah is one of the greatest places to hang out up there. I spent the last day of my adventure filled vacation relaxing in a hammock by the lake, skipping rocks on the water, and trying my hand at catching some beautiful brook trout. After spending 4 days in Moab, I feel as if I have just scratched the surface of things to do in the area. I think to myself, is it even possible to explore it all? One thing that I know is that I will definitely be back! 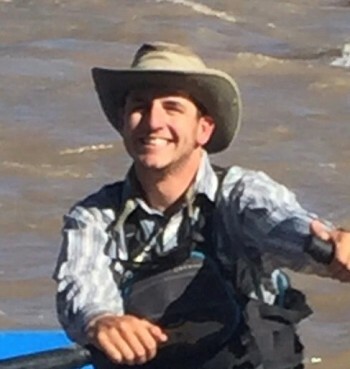 Hi, I am Brian Essig and I have been guiding with Western River since the summer of 2014. I split my time between Cataract Canyon, Desolation Canyon, and the Grand Canyon. In my free time I enjoy taking out my boat on private rafting trips and skiing.